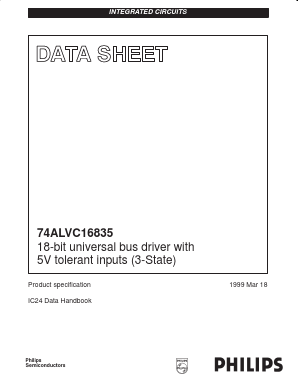 The 74ALVC16835 is a 18Ã¢â¬âbit universal bus driver. Data flow is controlled by output enable (OE), latch enable (LE) and clock inputs (CP). When LE is HIGH, the A to Y data flow is transparent. When LE is LOW and CP is held at LOW or HIGH, the data is latched; on the LOW to HIGH transient of CP the AÃ¢â¬âdata is stored in the latch/flip-flop.